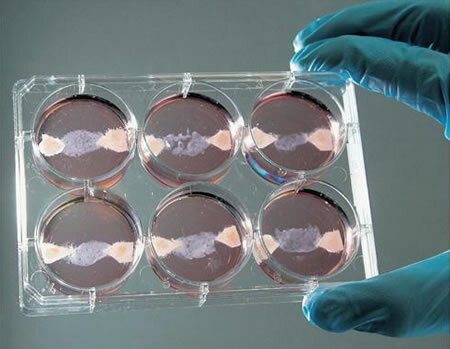 In-vitro meat, aka cultured meat aka petri pork could be coming to a burger joint near you. If they can get the prices down. According to Mark Post, a vascular biologist at the University of Maastricht in the Netherlands, the first lab-grown burger will cost about $345,000. So far he has produced whitish pale muscle-like strips, each of them around 2.5 cm long, less than a centimetre wide and so thin as to be almost seethrough. Pack enough of these together - probably around 3,000 of them in layers - throw in a few strips of lab-grown fat, and you have the world's first "cultured meat" burger, he says. Via Vancouver Sun; thanks to an anonymous reader for the tip on this story.